Bee, bees. Bees. Hairy Footed Flower Bees. Here they are again, and there I was thinking that the next-door-suburban-basement-garage-expansion-chimney-out-neverending-building-project would finally cease their wondrous presence. This year, bees more than ever. We can say: this a good year for the Hairy Footed Flower Bees, more than good. (I’ve written about their emergence in past years elsewhere in this notepad – last years account and one before that too). They overwinter somewhere in the chimney in the flat (how do they get there? 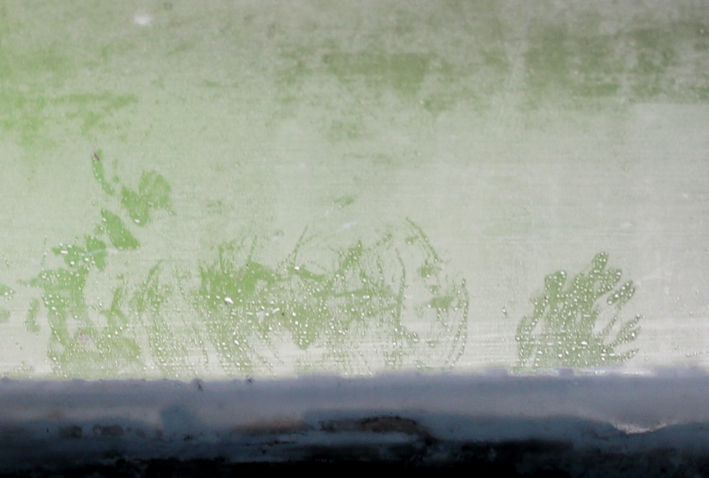 ), and then emerge in early March (what triggers them?). From around 8.00am until mid morning. 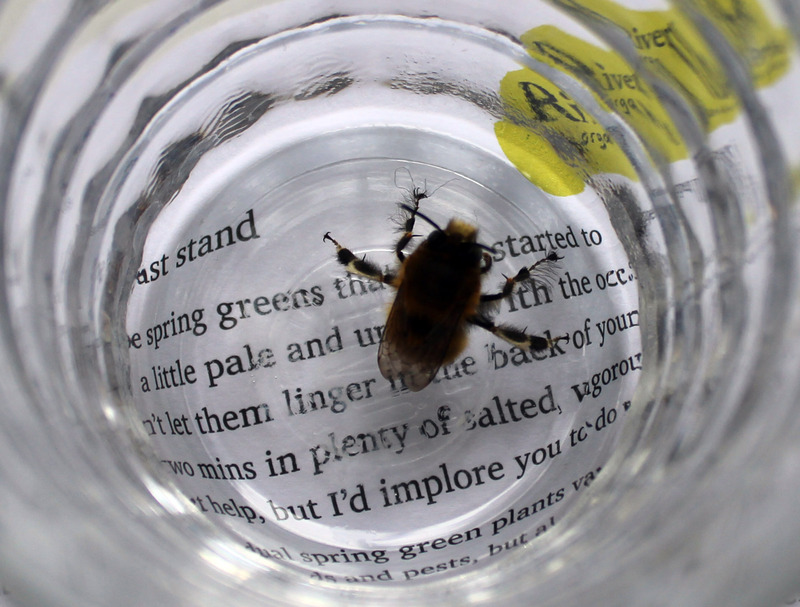 A deep and persistent buzz from behind the chest of drawers which stands across the chimney breast, and then a bee comes out from the side or underneath and heads straight for the large window, straight into the glass. The timing of their waking is a thing to wonder about. The flat is heated in the winter, the blinds go up and down, yet somehow they figure when to wake (the same days, give or take), and get out and about. 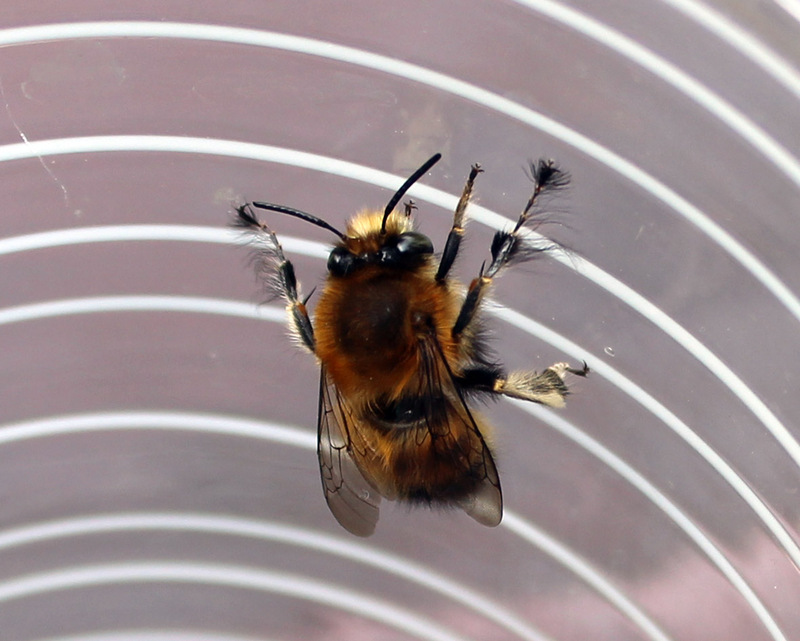 The Hairy Footed Flower Bee is what we call a ‘solitary bee’ – their nests don’t have a queen with workers, unlike bumblebees and honeybees. Clearly the ones here like to hibernate in the same place – they ‘gathered’. 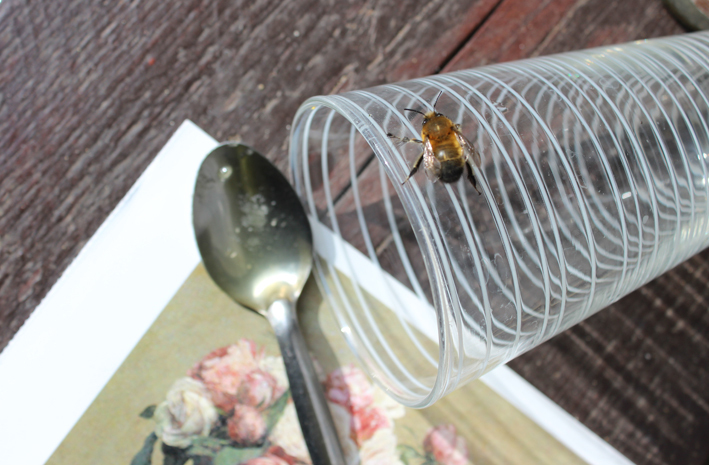 The bee has a relatively short season out with the flowers, from early March to June. Perhaps they like all the Comfrey and Pulmonaria that proliferates in the garden. This year, around 8 females (black, yellow fur on the back feet) and 35 males (honey coloured, very furry footed) have emerged – 3 females to start, then a run of males, and then after a break of a week in early April, another 4 or 5 females. It started around March the 12th with one or two, going up to about fifteen in one day around the 19th March and has now drawn to a close with the last one emerging on 13th April. A human, a glass and a series of different papers to focus the bee’s thoughts (Goya ‘Witch’ postcard, photo of Starlings murmuring, Give Blood envelope, a dull still life of roses) free them into the back garden. There’s much to be fascinated by in this process. 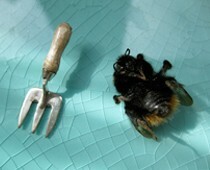 The bees hibernate where they are then trapped. They couldn’t get out to the garden without assistance. 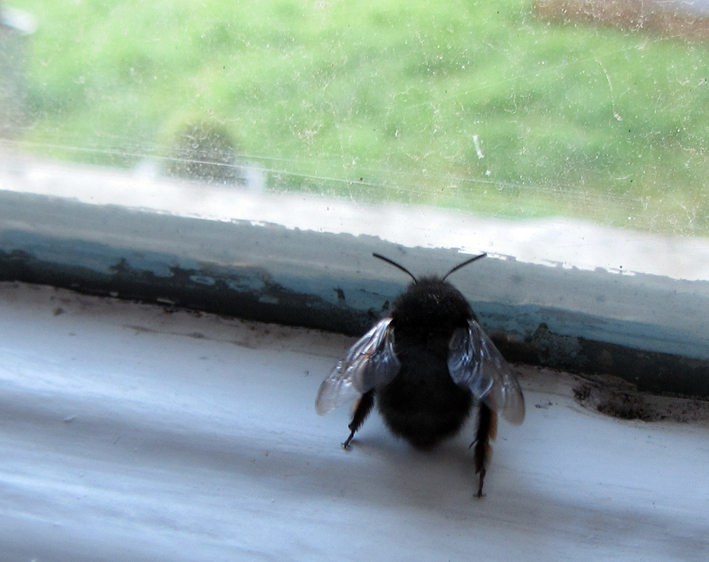 They depend on help yet act as if they don’t need any, scrabbling and buzzing at the window glass. On release, some fly high up immediately, some wait on the back step, their bodies undulating for some minutes before leaving. This pulsing abdomen, this positioning to sense the sun. 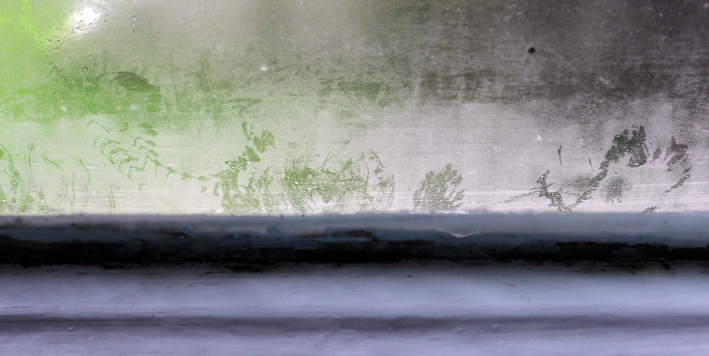 Some I leave in the glass hoping it will concentrate the little warmth, to help them – apricity. A couple of bees, discovered drowsy on the curtain in mid evening were left outside on the step in the cardboard shoe box that was prepared for the eclipse (but never used – cloud) as protection from a very cold night. Some emerge fully energised, ready for the life activity, while some crawl out from a long spent dream and the sense that the earth bound plane isn’t going to keep them long. A couple have died on the carpet, legs folded, quickly shrinking. Some I offer honey or sugared water to. One drank deep. I find myself thinking how important it is to try and live among these kinds of events, to have the patience, application, care – late for a meeting because of bee after bee one morning, sometimes one crawling around on the bed, on the rug – because the assistance, the help I can give to their exit is so clear, straightforward, easy; letting out these energies into the morning. And the bees have weak stings, if at all, and I’ve never been stung. I like helping them out the door. I like watching them fly off. It’s no small thing. 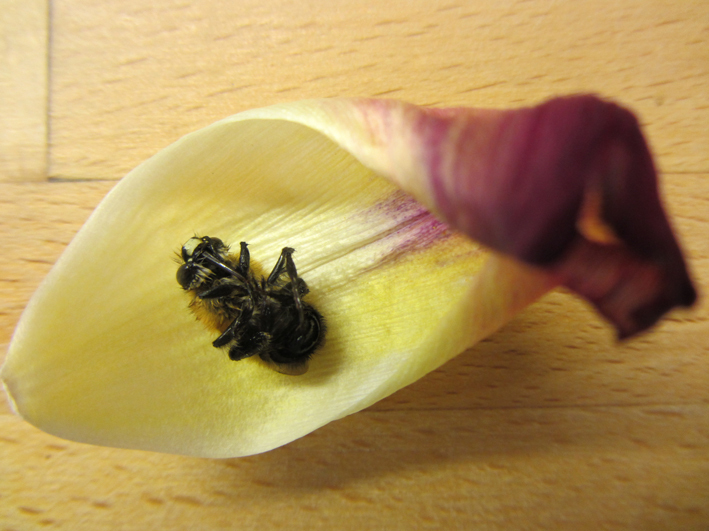 More information about Anthophora plumipes through this BWARS info sheet. And register any hibernating sites or sightings with BWARS. Ah. This was beautiful, timely, a lovely reminder and call to attention. Thank you.